We have distant our self from the higher class weather stations that need more space and time to assemble.When we buy a home device we are not only assessing his functions and features, but ease of use, installation, and design. The indoor outdoor thermometers make no difference. So it was important for us to review such devices, which will give you and your family fast and accurate information about the conditions outside and inside your home, and in the same time bland with your interior. In this package Ambient includes the temperature and humidity sensors and the main weather module. 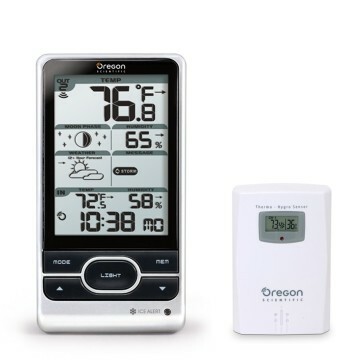 This ambient weather station is fairly easy to setup with owner’s booklet the guide you through the setup process. Ambient also provides 1 year limited warranty with this product. 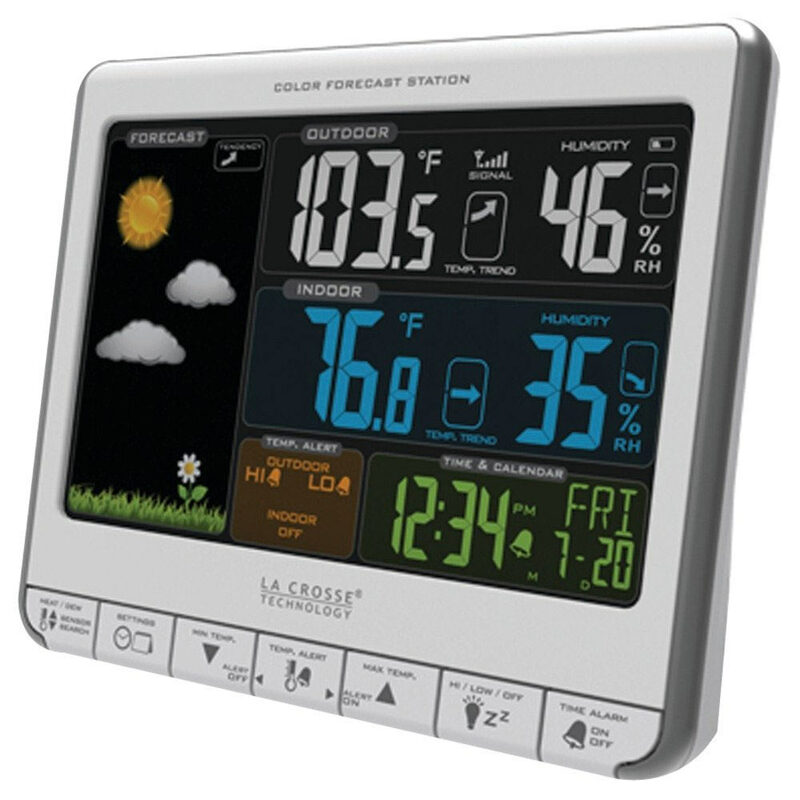 Despite the small screen size, which measures 5 inches diagonally, there is room for the minimal amount of information that you would look for in indoor outdoor stand alone weather station. This includes 12 or 24 hour (atomic) clock; day of the week and data, the indoor humidity and temperature, outdoor humidity and temperature, a weather forecast icon, barometric pressure; due point and air pressure history for the last 24 hours. At the bottom of the unit is where you will find a – set, alarm, min/max and adjustment buttons. And at the top is where you can access the snooze light button. The display is difficult to see from a curtain viewing angles but the light does help. The unit can be wall mounted but there is also a built in stand if you would prefer to use it on a desk or a shelf. If you do intend to hang it on a wall we would highly recommend to putting it at eye level because it can be difficult to see if it’s hung any higher. The receiver uses 3 AA batteries and the wireless sensor uses 2 AAA batteries. The batteries are not included with this unit. The Ambient 1171 ahs performed well in the time we have tested it. It is smaller that we expected and sometimes display is hard to see but the readings are consistent accurate. Wireless sensor: 2 “AAA” batteries (not included). 433MHz frequency that doesn’t interfere with other wireless stuff. Sometimes hard to see display without using the light. 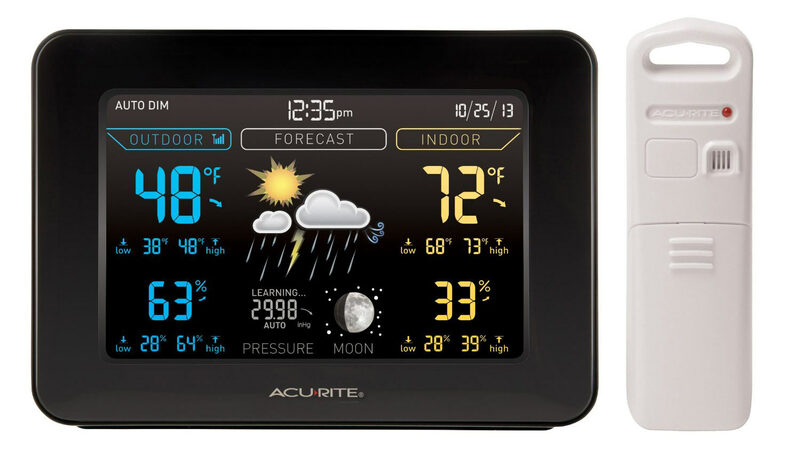 This indoor outdoor weather station by AcuRite includes all the necessary measurements you will need in this type of residential/urban weather station. It has indoor temperature and humidity, outdoor temperature and humidity, moon phases, barometric pressure with weather trend indicator, and time and data display. The unit includes patented self-calibrating forecasting that pulls organic data from the sensor unit in your backyard or balcony. The sensor collects specific sets of weather data points, including shifts in temperature, humidity and pressure to generate a personalized local weather forecast. Based on specific set of algorithms the weather unit analyzes changes in pressure and temperature to provide accurate future weather forecast. The AcuRite 02027 has an easy to see and well highly visible color display (nicely arranged and color coded) with tree different lightning settings. You can select light preference manually or use the Auto Dim Mode feature that automatically adjusts the light based on time of day and the year. The display can be wall mounted or you can use the stand for table top use. The outdoor sensor is easy to mount with wireless data communication and has a range of up to 300 feet (100 meters). The display uses a 5 V power adapter (included) or 3 AA batteries (not included). For Its power the wireless sensor uses 3 AA batteries. Overall this is a good unit that works very well with spot on data readings. This product is available with one year limited warranty. As with the other devices inside the package of the WS-9160 you will find two things – the outdoor sensor which will transmit the temperature data to the weather sensor and the station display sensor. The difference with this device is that this is only a temperature measurement station and if you want other type of readings you have to check the other entries in our list. Nevertheless this is very well made temperature measuring unit that is able to use up to 3 wireless sensors per indoor display. With the additional sensors you are able to monitor the conditions in different locations of your home such as bedroom, basement or garage. The outdoor temp unit is weather resistant and can transfers data from up to 300 feet. For best accurate readings the manufacturer recommends the the unit to be placed on north wall and with no direct exposure to snow and rain. Can transmit form up to 330 ft.
AcuRite 75007 is a nice big screen forecaster with future forecast capability that has an icon representation of what the weather could be in the next 12 to 24 hours. For the first 14 days the unit is in learning mode and will analyze the pressure changes in your area to figure out what is going one with the weather in your particular local area. 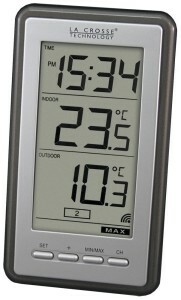 For your outdoor and indoor temperature you have nice and big readout which is easy to see by everybody. The wireless outside sensor has a build in temperature monitor a compact weather resistant case and has integrated mounting options for easy installation. The sensor uses wireless technology and you can put it out wherever you need to up to over 300 feet away, depending on the conditions in your home. The sensor 433 MHZ signal does have a lot of wall penetrating power so you can be assured that you are going to get very strong signal wherever you at. The RCC atomic clock is synced with National Institute of Standard and Technologies that makes sure the clock is always accurate as possible. This weather instrument provides a fantastic value. If you aren’t ready to drop a hundred or more dollars for a professional unit, consider this one. The 308 1412 has 12 different animated panels that will evolve according to conditions. This La Crosse station is equipped with trend indicator for in and outdoor temperature and humidity, and has customized alerts for high and low temperature readings, from both the station and the remote sensor. The barometer calibrates over 3 to 4 weeks period, giving you the most accurate forecast for your region. You can select between high and low temperature alarms that will help you prepare before you step outside. The LCD screen features animated color forecast icons that react 12 hour changing barometric pressure to help you better plan your day around your weather. Some other key features include –atomic time and date settings allowing it to accurately set itself over time. The indoor display sits conveniently on any surface of your home of office and looks great. This is not a wall mounted unit so you would want to set it on the kitchen counter, shelf or a window. This wireless color forecast weather station is not only functional but it’s fun. The icons are great it’s appealing and will look good on any surface in your home or office. The 308-1412 is equipped with convenient USB charging port on the back of the panel. 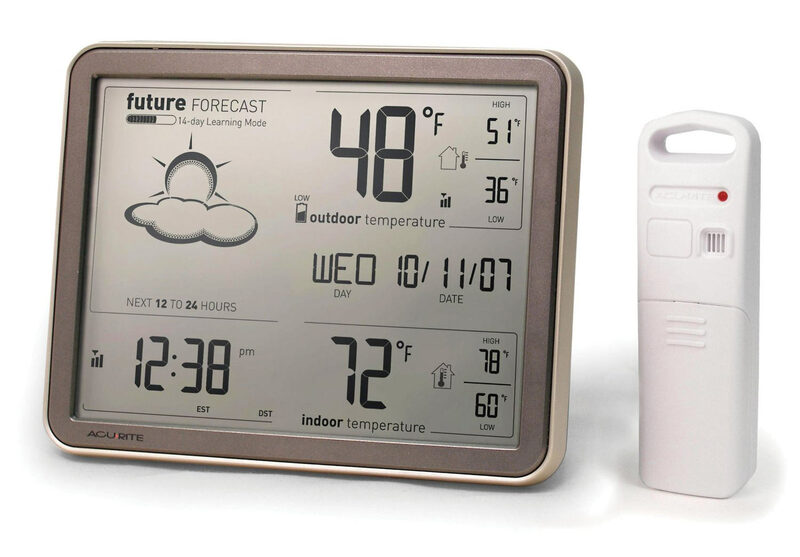 BAR208BAH is digital weather station weather for climate control for indoor and outdoor conditions. Similar to WS-9160 the unit it can receive a signal from 3 temperature sensors simultaneously for monitoring additional rooms in your home. The station features build in weather forecast for 12 to 24 hour period, indoor and outdoor temperature and humidity monitor with three levels of humidity and temperature trends (rising, steady or falling). This additional reading will give you more information on where the weather is going today. Those with interests in the moon phases will not be disappointed because the weather display provides such information with large and visible icon. Another interesting features are the weather warnings that are a bit different forum another entries in our list. Here this Oregon Scientific model will alert you with 5 extreme weather alerts – storm, wind, fog frost and heat. With these accurate messages for extreme heat, high winds, storms, fog and frost you will me more prepared for these conditions ahead of time. The self adjusting atomic clock and calendar is another good feature to this well made device. 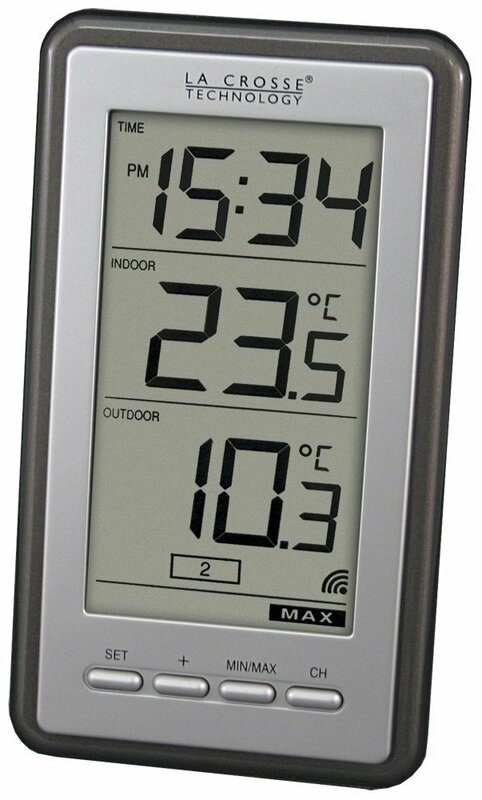 Overall this is solidly build weather station with good design, large display numbers for outdoor and indoor temperatures and humidity, and accurate outdoors sensor. Every Acurite thermometer I have purchased has been totally inaccurate. I have also owned cheaper ($10 – $15) inaccurate AcuRite models. But I very much like 02027. It has spot on humidity and temp with the best in this class. 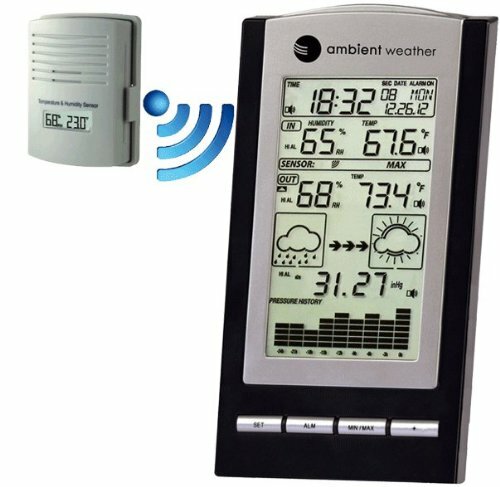 Can I use two different temperature sensors (one outside and one inside the home) and set up a system and sensors up to send me an alert when the outside temperature equals the inside temperature? We live in the mountains of Colorado and we don’t use air conditioning, the nights are cool enough that in the evening we open the windows to cool down the house and in the morning close the windows when it starts to get warm. We spend a fair amount of time looking at both the indoor and outdoor thermometers to see when they reach equilibrium in order to optimize the cooling of the house. I would love to use your system and third party sensors to let us know when the inside and outside temperatures are equal. Around the world millions of people/households perform this same task every day. A simple solution to optimize this almost universal practice would create huge savings in power usage and carbon creation, not to mention the quality of life benefit.